What if we told you there was a Gettysburg memorial worth a quarter of a million dollars–$250,000!–and that you’ve probably never seen it? Would you believe us? Well, it’s true! And unless you’re a diehard Gettysburg groupie, chances are that you haven’t even heard of it. The Coster Avenue Mural in Gettysburg was designed by artist, historian, and Civil War descendant Mark H. Dunkelman, who painted it with the assistance of mural master Johan Bjurman. Dedicated on the 125th Anniversary of the Battle of Gettysburg, the mural depicts the clash between Union Colonel Charles R. Coster’s forces (27th Pennsylvania, 134th & 154th New York Regiments) and the Confederates led by Brigadier General Harry Hays & Colonel Isaac Avery. Coster’s Brigade made their stand behind a fence-line in Kuhn’s Brickyard, taking what little shelter they could from the wooden fence posts, but mostly exposed to enemy fire. The Confederates, who far outnumbered the Union soldiers, descended upon the fence so quickly that Coster’s men only had time to fire six to nine shots each before the fight broke into clusters of hand-to-hand combat. Confederate forces overwhelmed the smaller contingent of Union soldiers, taking many of them prisoner and pursuing others nearly to Cemetery Hill. All told, it was a brief, brutal assault that took the lives of 563 of Coster’s men, while the Confederates lost 200 of their own. 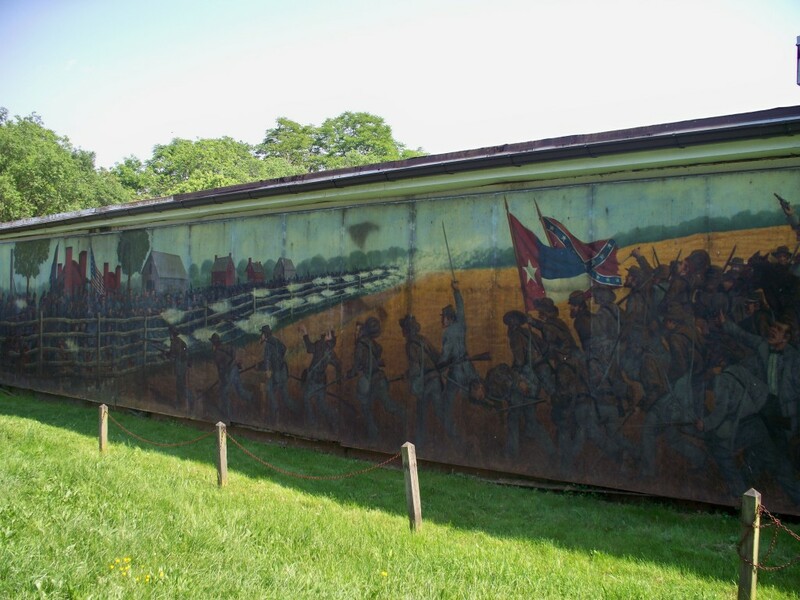 National Park personnel report that Coster Avenue, the site of this breathtaking mural and monument, is the least visited portion of the battlefield. Overlooked, unknown, and often alone, it’s a sad truth that this memorial to American soldiers is not often remembered. Will you be the exception? Will you remember the forgotten soldiers, who fought and died in Gettysburg? Posted in Feature Stories, Monuments, The Civil War, Things To Do and See and tagged Colonel Charles R Coster, Coster Avenue Mural, Gettysburg 125th anniversary, Gettysburg Memorials, Harry Hays, Isaac Avery, Johan Bjurman, lonely mural, Mark Dunkelman, New York regiments, Pennsylvania regiments on August 15, 2012 by jamessear.